After the Aspire, it was time for the second-gen Figo to receive its midlife update. These updates usually address major issues plaguing pre-facelift models. So, what could be the need of the hour for the Figo? A heart transplant? Yes, the petrol-powered pre-facelift Figo was uninspiring and lethargic, unlike its diesel counterpart with a drool-worthy punchy engine. 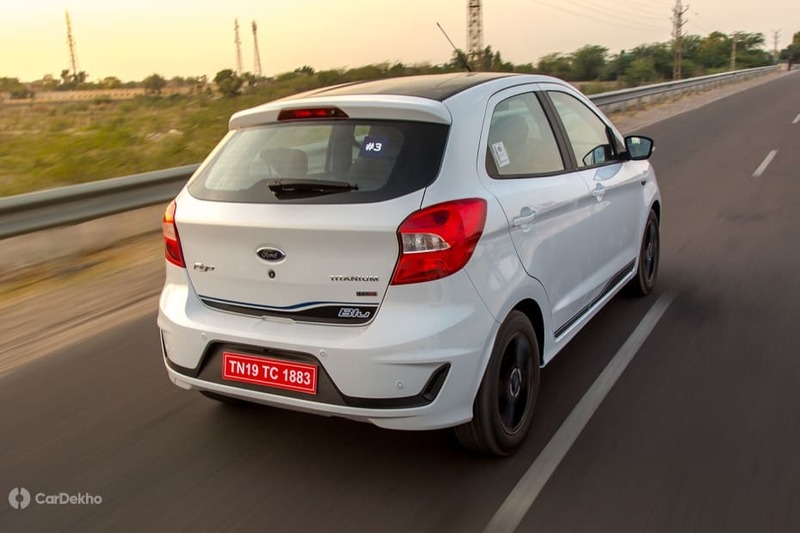 To counter that, Ford has now introduced its new Dragon family of petrol engines in the updated Figo along with some minor styling and feature updates. 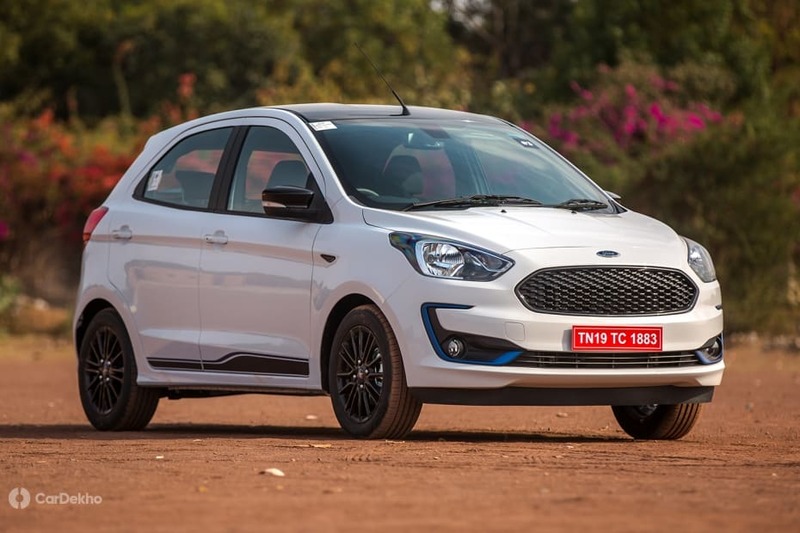 Are these changes enough to put the Figo back as an option worth considering? 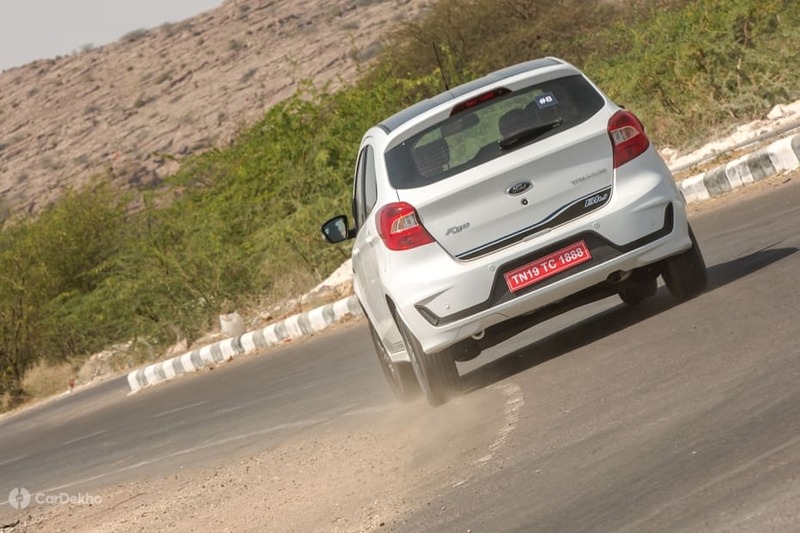 We took the updated Figo for a spin in sunny Jodhpur to find out. The exterior updates for the refreshed Figo were previewed by the Freestyle and updated Aspire last year. 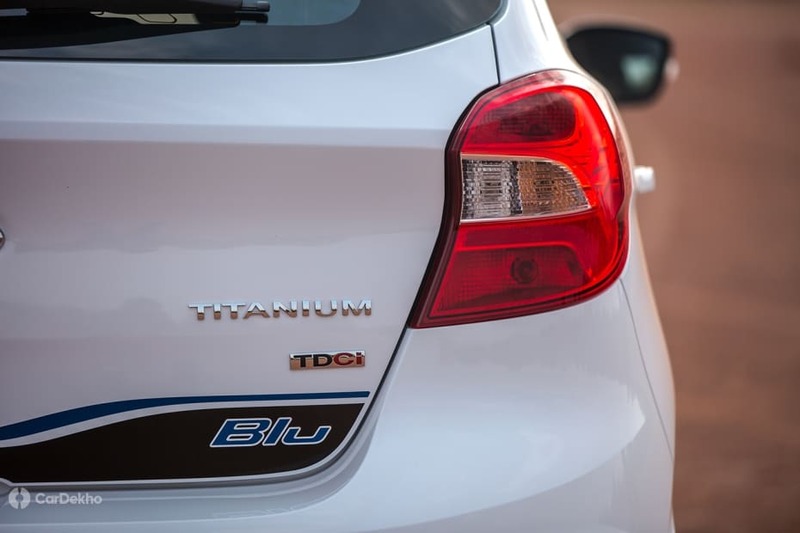 The element of surprise for us was the new range-topping Titanium Blu variant, which looks much like the previous S. So we will be focusing more on the new Titanium Blu variant. The refreshed front fascia looks sharper than the previous model. 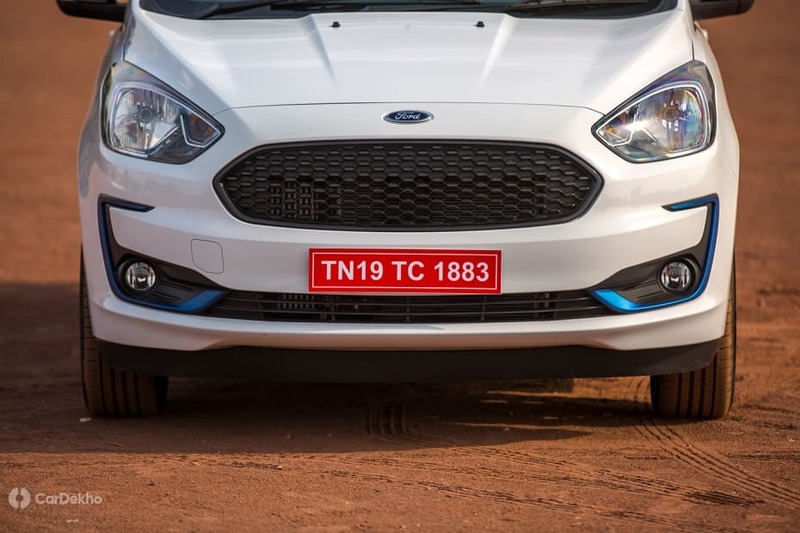 The slats in the grille have made way for a mesh pattern and the Blu variant gets a glossy black finish, while the lower Titanium offers chrome. The lower air dam has also become sleeker and wider than before and the fog lamp housing features blue accents in the Titanium Blu compared to chrome in Titanium. The headlamps remain multi-reflector units, but are smoked and features a slightly different internal detailing. The side profile is identical to the pre-facelift model except for the blue and black decals and Aspire's multi-spoke alloy wheels finished in gloss black. The roof as well as the outside rearview mirrors feature a gloss black paint job to jazz up things in the sportier Blu variant. Apart from the Oxford White that you see in the pictures, the Titanium Blu variant is also available in Moondust Silver and Smoke Grey. Speaking of the regular model, the flashy orange shade offered before has now been replaced by the White Gold which debuted with the Aspire. Changes at to the rear profile are also limited except for the dual-tone bumper, which mimics the one up front. There are decals on the boot lid and that’s where you get the hint it is the top-spec ‘Blu’ variant, apart from its sportier appearance. The Figo now features rear parking sensors, standard across the variant lineup as per the norms. Overall, if not for the rear spoiler, the Titanium Blu actually looks like a successor to the previous S variant. You can, however, get that spoiler from the Figo’s official accessories. 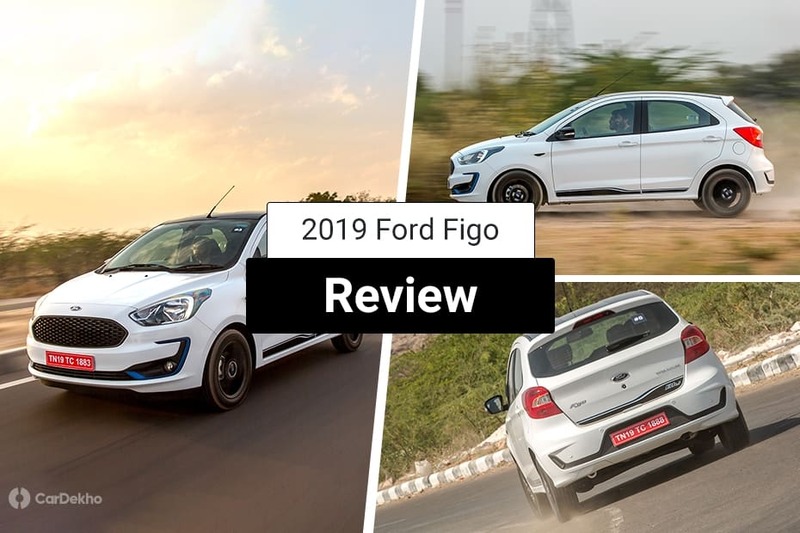 The aesthetic updates on the updated Figo have refreshed the styling and added a couple more years to its life. The Titanium Blu variant, in particular, stands out compared to the lower variants as well as its peers since it has a more squat stance thanks to the fatter wheels and dual-tone paint job. 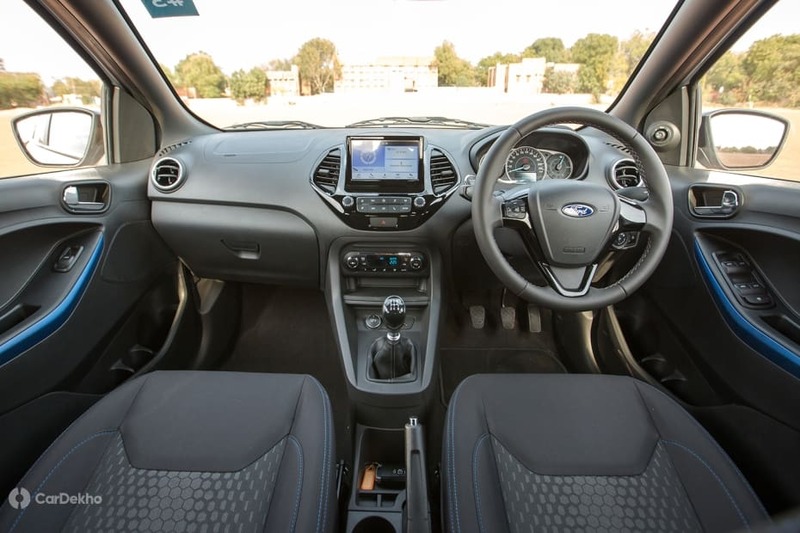 Simply put, the interior of the Figo is largely carried over from the pre-facelift model. 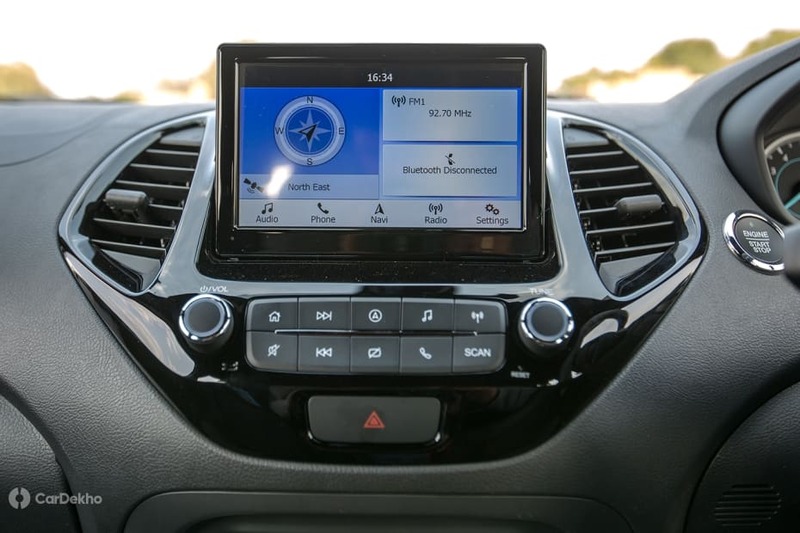 What grabs your attention is the redesigned central console. 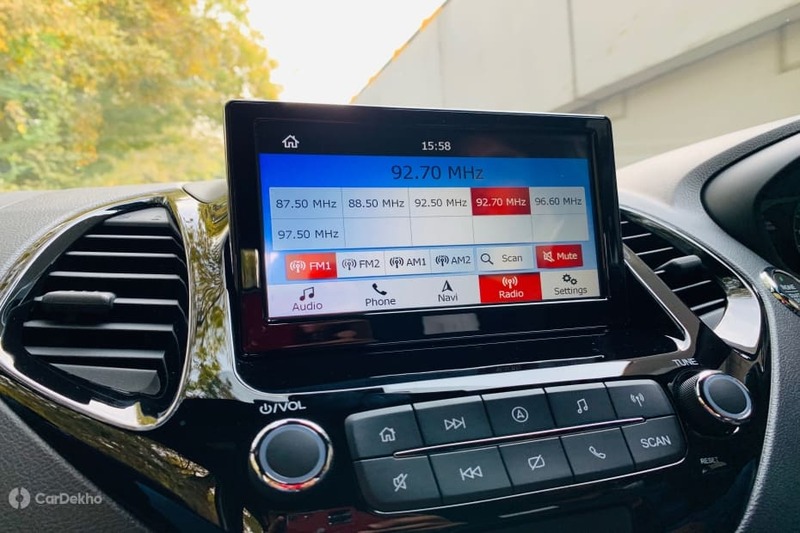 The cluttered and button-heavy centre console has been replaced with a sleek, floating 7-inch touchscreen in a piano black-finished panel. The cabin of the Titanium Blue variant is all-black -- the dashboard, the headliner, everything is jet black! 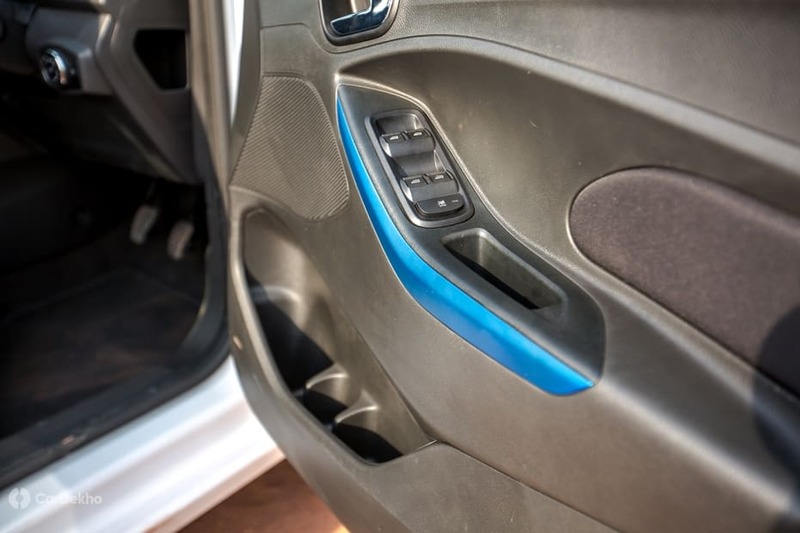 There are blue accents on the doors to complement the exterior theme and the dark upholstery features contrasting blue stitching. The darker theme lends the cabin a sporty feel, but some could find it a bit claustrophobic. Personally, I love the black headliner on this variant. However, this all-black treatment is limited to the top-spec Titanium Blu variant as the lower Titanium features a lighter headliner. 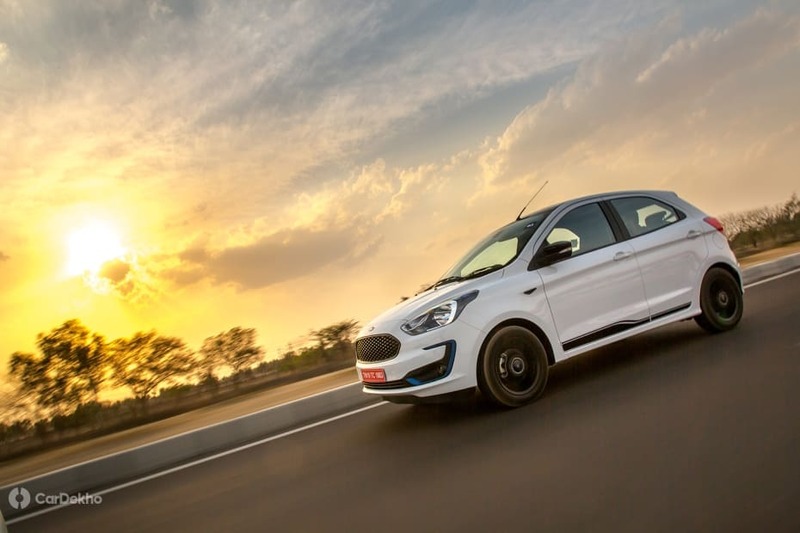 Coming to the most significant update in the Figo, its new set of petrol engines from Ford’s newest ‘Dragon’ family. 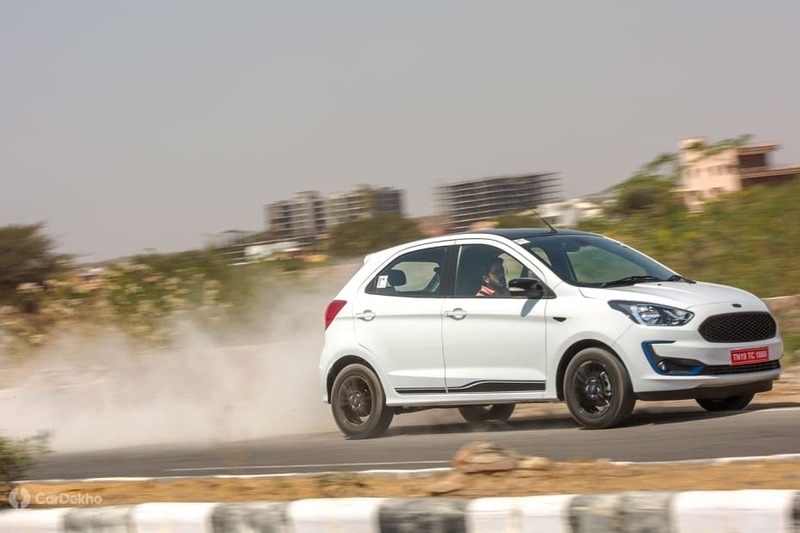 There's a 1.2-litre and a 1.5-litre petrol engine on offer, both 3-cylinder units. The former is offered with a manual, while the latter is exclusively available with an automatic. 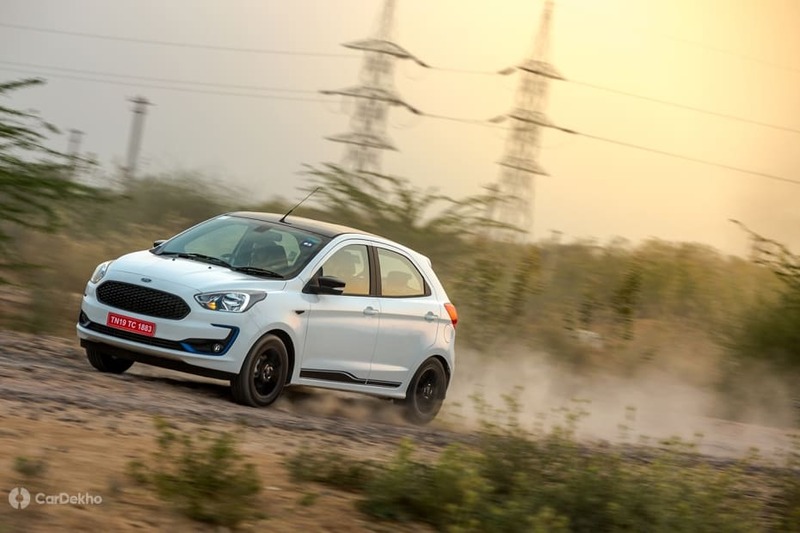 The petrol powertrain options are, in fact, completely fresh for the updated Figo as Ford has introduced the new 5-speed manual gearbox for the 1.2-litre as well as a 6-speed torque converter for the 1.5-litre, replacing the previous 6-speed DCT (dual-clutch automatic). The diesel engine has been carried forward from the pre-facelift model as is. However, it has also received the new 5-speed manual. 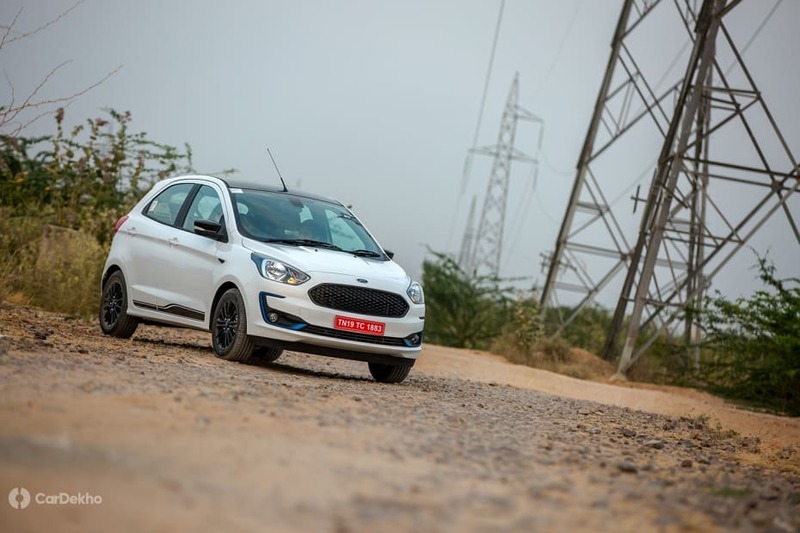 We drove the new 1.2-litre petrol as well as the diesel, while the 1.5-litre petrol automatic wasn’t available. Let us begin with petrol first. We’ve already encountered the 1.2-litre three-cylinder Dragon petrol on the Freestyle and most recently, the Aspire facelift. It is a huge, huge improvement over the old four-cylinder unit of the same displacement. And the updated Figo turned out to be no different. 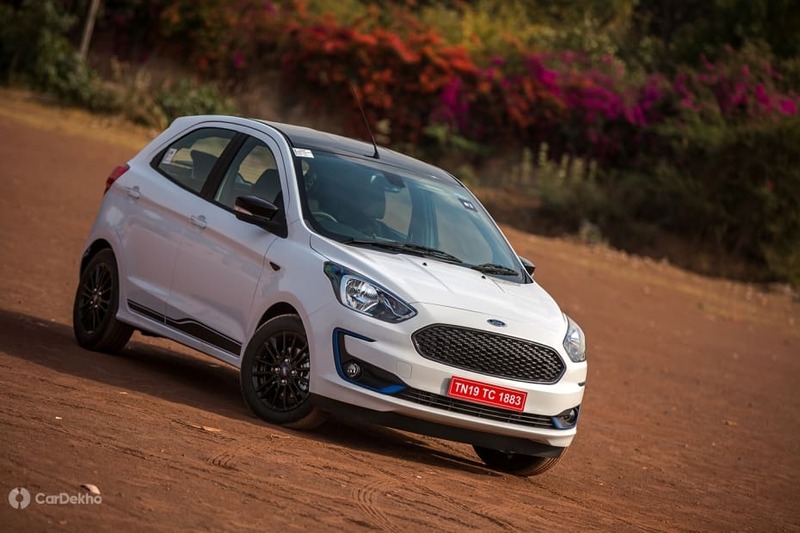 The new 1.2-litre is not only peppier but also more efficient than the engine (18.16kmpl) it replaces. Being a three-cylinder engine, the new 1.2-litre purrs to life with a mild vibratory cold start. But it gets fairly smooth in no time. The engine is fairly refined given the segment standards and has a sweet note when pushed hard. The engine isn’t that responsive initially, but that doesn’t mean it requires frequent downshifts as it pulls cleanly in higher gears. The engine changes character around 3000rpm as it begins to surge ahead eagerly as it offers a pretty meaty mid-range. Just like other small displacement naturally-aspirated engines, it needs to be revved to extract the most out of it. Keep it in its sweet spot and the new three-cylinder engine won’t disappoint. Power comes linearly and in a tractable manner till it maxes out just below the redline at 7000rpm. Out on the highway, the Figo is capable of hitting triple-digit speeds rapidly and its brakes are confidence-inspiring. This is expected because the Freestyle and the Aspire, based on the same platform, display these traits as well. 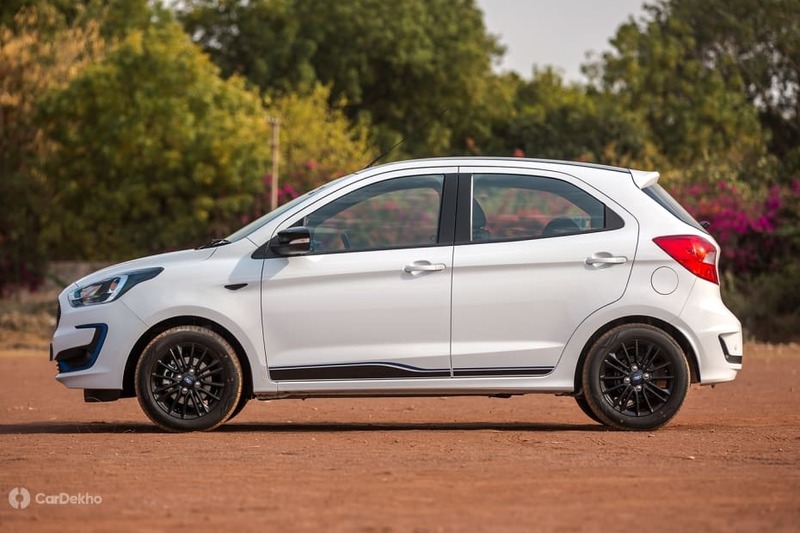 The diesel continues to shine with its outright power and torque, which are the best in the segment. 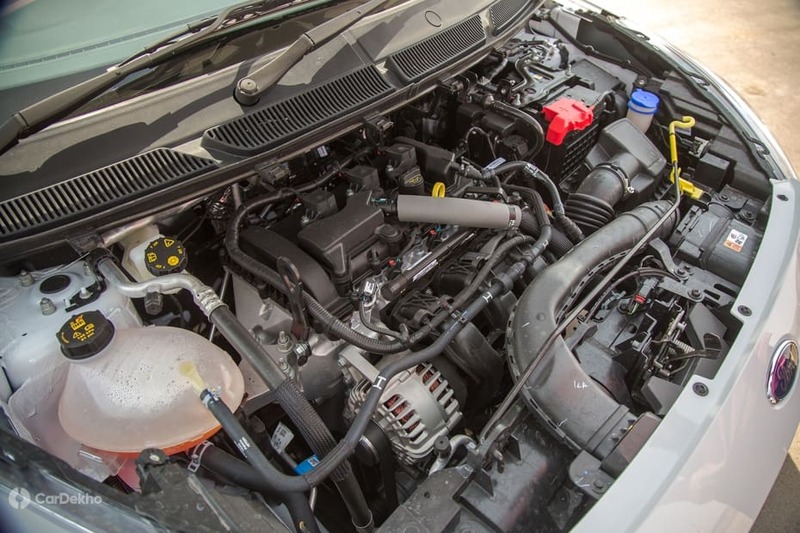 From the get-go, the diesel pulls and pulls and pulls with hardly any turbo lag. 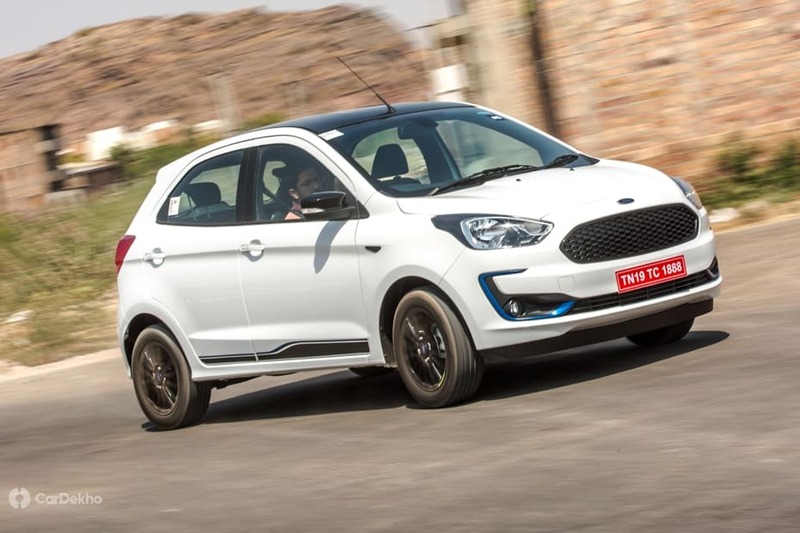 We won’t be focusing much on the diesel as it has been carried forward, but continues to be among the strongest points for the Figo. Enriching the whole experience is the new slick-shifting 5-speed manual from Getrag. Available with both the new petrol and the diesel, it slots in much better than the older one. 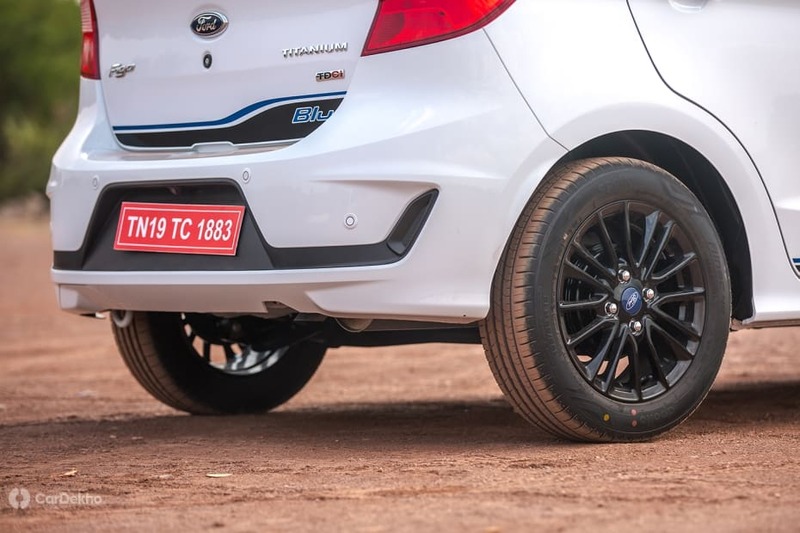 Ford has not tinkered the suspension setup with this facelift. So, the Titanium Blu or the other variants don’t get the stiffer setup offered before with the S to aid handling. It is, for now, a successor to the previous S variant, but aesthetically. 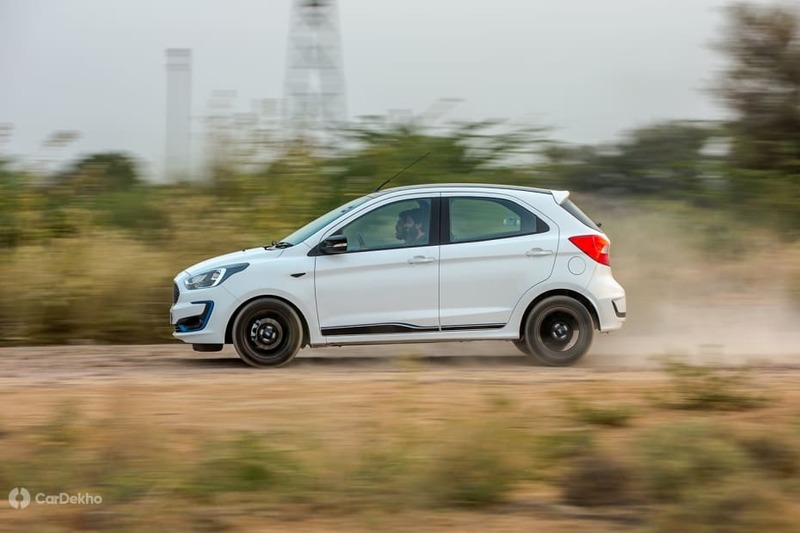 The suspension setup on the Figo is well tuned for Indian conditions and it offers a mature ride. It feels a bit bumpy sometimes at the back, and this is something we’ve experienced with the Freestyle and Aspire as well. These aren't deal breakers though, but some might experience these things. 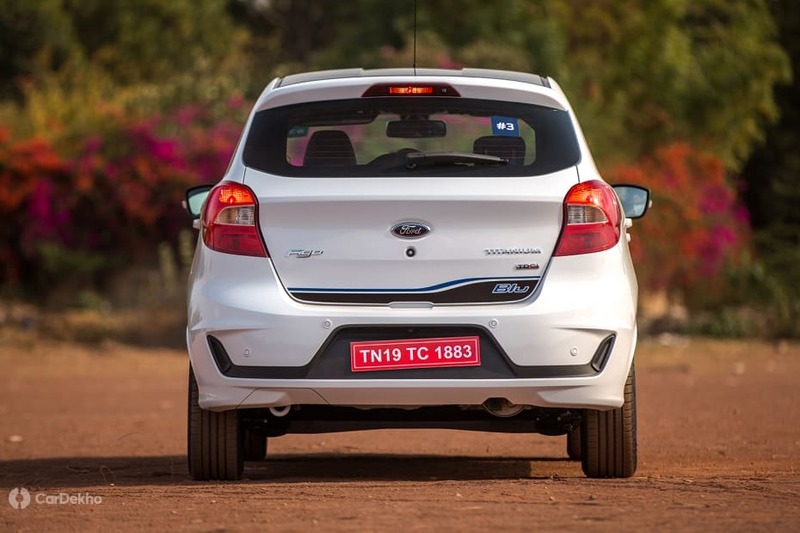 The Ford Figo is available in three variants: Ambiente (base-spec), Titanium and Titanium Blu (top-spec). 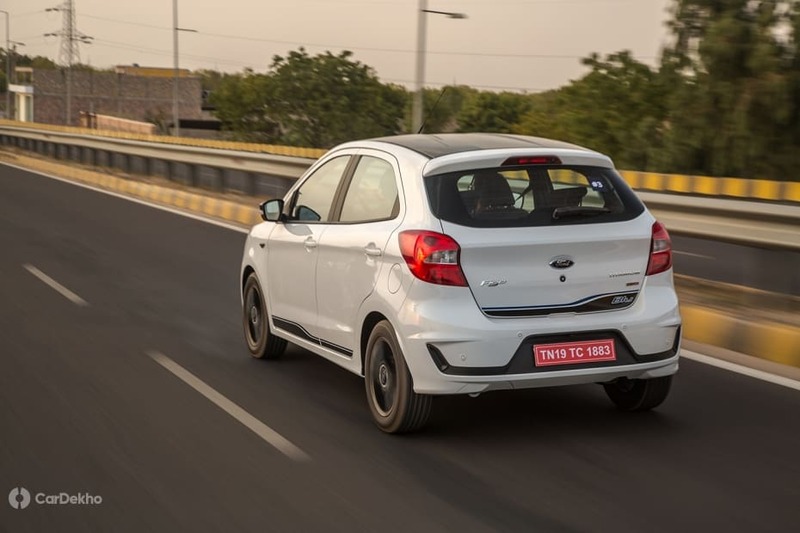 While the 1.2-litre petrol and the 1.5-litre diesel can be had with all the three variants, the 1.5-litre petrol automatic is limited to just the mid-spec Titanium. 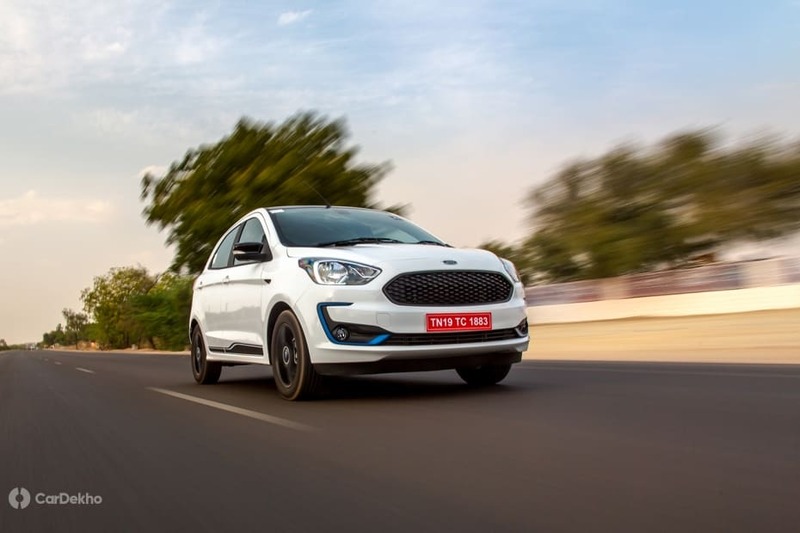 The updated Figo is available with dual front airbags, ABS with EBD, front seatbelts reminder and rear parking sensors as standard across the variant lineup. 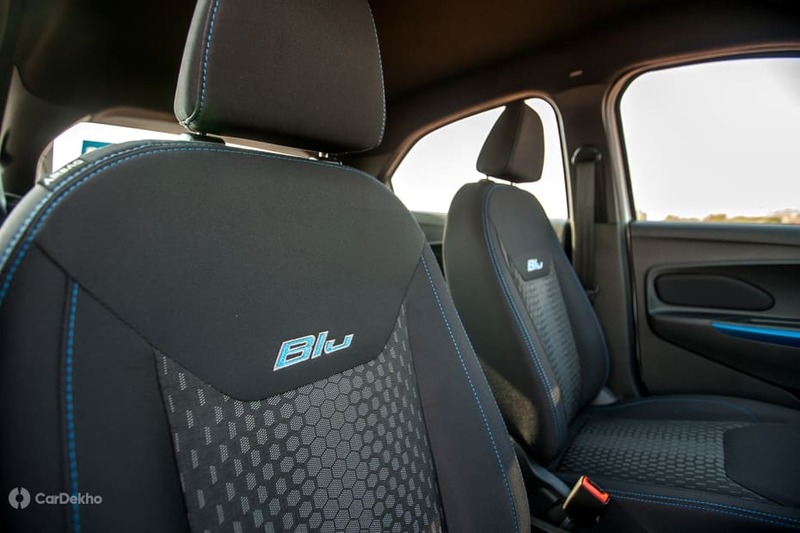 The top-spec Titanium Blue variant adds side and curtain airbags, which are exclusive to the Figo in the segment. 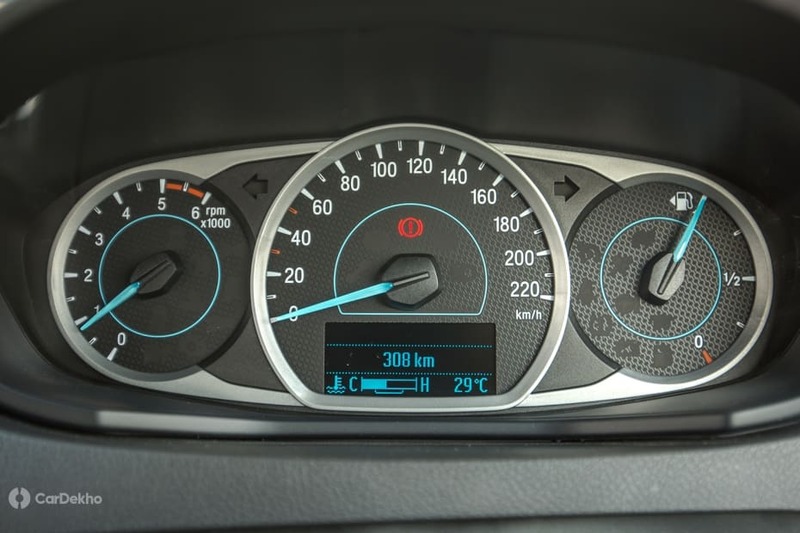 The petrol automatic variant exclusively comes with ESP (electronic stability program), TCS (traction control system) and HLA (hill launch assist) -- these are also segment–firsts.